Customers have choices when it comes to selecting a local business and search is often their starting point: 82 percent of people use search engines for local information, and 70 percent view several businesses before opting for one. An appealing, informative Google My Business listing can not only help them find you in local search but also differentiate your offerings from your competitors’. Recently, Google added three features for local listings that give business owners even more ways to engage with their customers. Check them out below. Google fully rolled out Posts for the Google My Business (GMB) platform last June. Prior to that, the feature had been available only to political candidates and a handful of small businesses. As the name suggests, business owners can post directly to their GMB Knowledge Panel listing in the search engine results pages (SERPs) and Google Maps. You can communicate instantly with customers through the platform using a desktop or Android or iOS apps. Simply go to your GMB account and click “Posts” on the menu on the left side. Customers can tap to read Posts or share them from Google with friends and family. Provide opportunities to make a reservation, sign up for a newsletter, buy a product, or claim an offer with call-to-action buttons. Character Count: The character count with spaces for text Posts before they are cut off with ellipses is approximately 57 on mobile devices and 54 on desktop. When you have more than one live Post, the character count is 100 with spaces. Keywords: Write naturally. Including keywords won’t impact rankings. Posts aren’t being indexed at this time. Metrics: Insights, such as views and clicks, are available 2-3 days after a Post goes live. Click on the Post from your GMB dashboard to view them. 2 For conversion data, consider creating a custom URL with a UTM code and tracking them via Google Analytics. Time: Posts expire after 7 days, except events, which stay live until the event has passed. Scheduling is not available. Limit: You can publish up to 10 Posts at a time. Google will format them in a carousel. Customers can see 2.5 Posts in the SERPs and scroll for more. 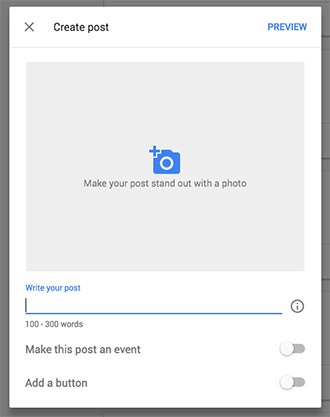 For more information about setting up Google Posts, view this help document. Since July, customers have had the option to text message participating business owners directly from their GMB listings in the SERPs. You can activate this feature by signing into your GMB account and finding the ‘Chat’ card in the Home menu. Once you enter the number to a device that supports SMS, Allo, or Android App Preview Messages, you can receive texts from customers as long as you have the feature on. Help more people find your business location. Responsiveness: Make sure to turn off the SMS Chat Messaging feature when you’ll no longer be available to receive messages. The feature does not sync with the opening and closing hours on your GMB listing. Once it’s off, the message icon will not appear in the Knowledge Panel. Google suggests responding to customers as soon as possible. 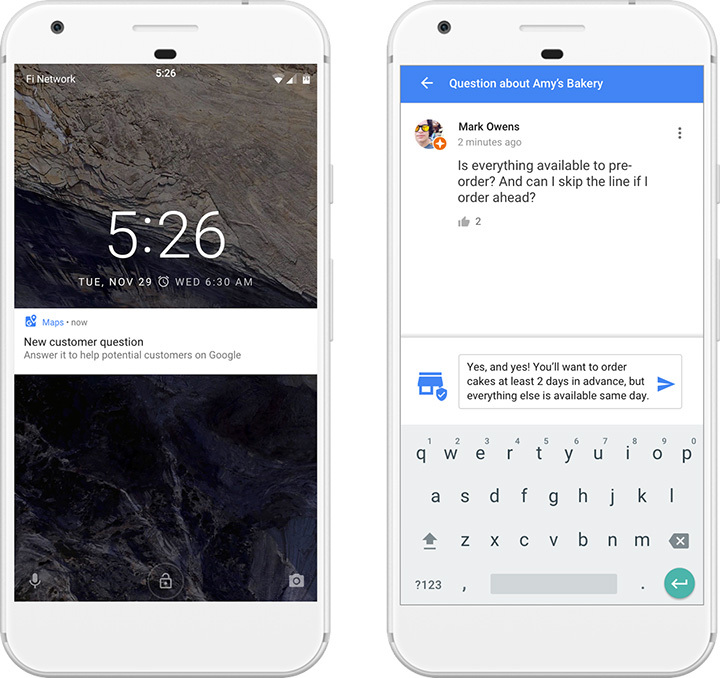 Once you’ve replied to a few messages, Google will calculate a response time, which customers will see when they contact you. Customer Service: Consider whether or not using SMS Chat Messaging will support or deter from your ability to provide excellent customer service. If there is no one in your business to professionally and consistently manage this feature, it may not be a good idea. For example, text messaging could prove valuable for a plumber or contractor who lacks a support staff to take calls and schedule services. However, a company that relies on phone sales may want to focus on those lines of communication instead. If you’re not sure, you can always test the feature and turn it off if it’s not right for your business model. Rankings: While the feature is not a ranking factor, it could impact conversions. Customers might choose to contact businesses offering the feature and providing the quickest response times. Metrics: You can track the number of message button clicks, conversations with customers, and text messages. 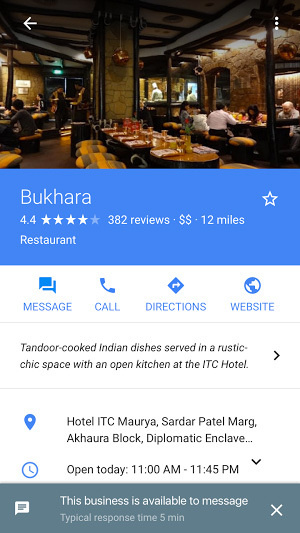 In August, Google launched a feature called “Questions and Answers” that allows business owners and customers to ask and answer questions via the business’s GMB Knowledge Panel in Google Maps. Previously, you could only ask and answer questions via the Google Maps Android app, but, thanks to a recent update, you can now use mobile browsers for these actions. Customers and business owners can thumb up content to boost its rankings. Add FAQs to your own GMB business listing(s) so that users can find quick information that may not be listed on your website, or necessary to contact you directly about. Provide accurate information to customers’ questions. Instructions: Instructions for asking or answering questions can be found here. Usage Policies: Read Google’s policies to determine which types of content are acceptable for this feature. For example, advertising isn’t permitted—neither is spam. Be Proactive: Populate your GMB listing with useful, valuable questions and answers. Make sure the content is accurate and easy to scan. Use Open-Ended Answers: Customers can delete or change their questions. Avoid “yes” or “no” answers so the meaning of your content cannot be manipulated. Monitor: Being the first to answer questions not only deters problematic answers from customers but is also a sign of responsiveness and good customer service. Keep Your Cool: As with reviews, it’s possible you’ll receive some provocative questions and answers. Always stay calm and handle the situation professionally. If the content violates Google’s policies, you can report it for removal. There are neither notifications nor the option to answer via the GMB dashboard. The only way to get a notification currently is using the Google Maps Android app, which is frustrating and clearly self-serving IMO. This Android app will also allow business owners to respond to questions. With these three new GMB features, business owners have even more ways to connect with customers: whether that means telling compelling stories about their brand, sharing events, or answering questions. Recently, Google also made it easier for you to edit you local business listing: if you’re logged into you GMB account, you can search for your business and start editing directly from the SERPs. It’s never been easier to keep your customers updated and informed of your business offerings. You wouldn’t chat up your boss about last night’s raging party, and boring a date with the intricacies of high finance would be out of the question. The same etiquette of social appropriateness applies to social marketing and advertising, where opportunities to engage—or alienate—your audience abound. If, like any savvy digital marketer, you’re targeting customers across their preferred channels, devices, and platforms, you may stand to learn two valuable lessons from none other than hookup-hub Tinder about how best to pique their interest and earn their trust, using the right platforms with the right messages at the right time. Sure, you know your audience. You’ve done the work: segmented, collected data, created personas. But “Social Worker Susan” probably projects a very different version of herself to family and colleagues on Facebook than she does to friends on Snapchat and potential love interests on Tinder: from cardigans and glasses to silly, painted faces to leopard crop tops and vermillion lipstick, profiles and attitudes shift across platforms—and so should your presentation of your brand. Tinder’s Marketing Manager, Kyle Miller, recently underscored the importance of understanding how your audience navigates a specific environment at this year’s Digital Summit LA: Tinder users are looking for excitement, adventure, and new experiences and people. Therefore, brands advertising on Tinder should attract, titillate—even shock—users better than the best profiles. When you create your next ad, think about your audience’s mindset on that platform. As Laura Wilson, Director of Digital Engagement and Social Media at Georgetown University, revealed at Digital Summit LA, Facebook users post aspirational versions of their lives—marathons, travel, babies—while users embrace Snapchat because the impermanence of their images and videos allows them to be less self-presentational, to have fun. The brands that stand out from the clutter of social ads and content are often the ones who truly bring value to the relationship with their customers. Whether it’s a hilarious video, a tutorial on how to grill the best steak, or an identifiable brand story, your customers will appreciate you more when they’re cracking up their coworkers, impressing their friends, or finally finding a feeling of belonging in a little corner of the vast web. Be the reason your customers feel like better versions of themselves. Give them experiences that will make your brand unforgettable. Tall order, right? It doesn’t have to be. Scale your marketing to your resources: maybe a video isn’t in the budget now, but perhaps a contest or giveaway is. Whatever the scope of the campaign, strive to inform, intrigue, and entertain your audience. Sixty-five percent of the adult population in the U.S. is on social media, and there are 1.6 billion active mobile social accounts globally.12 These statistics are hard to ignore. Brands taking notice of them and acting should remember Tinder’s advice to advertisers: know your audience’s mindset on the platform they’re using, and align your marketing message to it. And, as Digital Summit LA Keynote Speaker, Author and MarketingProfs Chief Content Officer Anne Handley recommends, place your brand in the context of your customers’ lives and make sure your messaging is bigger, braver, and bolder than your competitors’. With more customer data available to marketers than ever before, the real question is how to utilize the information for more effective marketing. Audience targeting, the process of using market segmentation and personas to understand and empathize with your customers in order to construct customized campaigns, is one excellent use of this data. In previous blog posts, we showed you how to segment your audience and how to create personas. Now we’ll share how to use personas to target your audience with personalized content. Customers typically take a series of actions before converting to a sale. Using our gym example from the previous blog posts, the first step that our persona, Social Sara, may have taken when she decided to join a gym may have been to search online for fitness facilities in her area and check if they had classes. She may have considered several other factors before selecting a gym (Is the location close to home or work? What available class times? What’s the price? What size is the class? Who is the instructor/trainer?). In marketing, the path to conversion is known as the consumer decision journey. While the consumer decision journey is often marked by the influence of traditional advertising and in-store interactions, since we’re a digital marketing agency, we’re only going to focus on the target audience’s online experience. 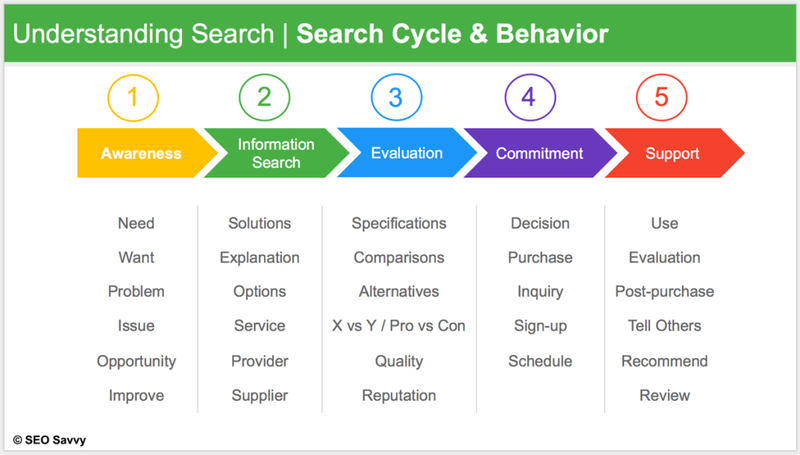 When a person uses online search to find a product or service, they typically go through stages to find what they are looking for. Let’s take a look at the consumer decision journey and search cycle to see how your business might be able to approach each stage when marketing online. It’s important to note that a person will spend more or less time in these stages based on the price of the product or even the complexity of the service. So they may go through these stages quickly if the product is inexpensive or an impulse purchase. Whereas an expensive purchase or complex service will warrant more time to arrive at a purchase decision. Awareness: Is your website and content optimized with the keywords your persona is using to search for the products or services you offer? For example, some keyword research might reveal that Social Sara is entering “fitness classes LA” into Google or Bing. Information Search: Customers are often faced with more than one option. Do you have pages and blog posts on your website to answer their questions, provide solutions and explain the options that ultimately persuade them you’re offering what they need or want? Evaluation: As customers move closer to making the purchase decision they will evaluate details and make comparisons. They will include comparisons on price, quality, specifications, pro vs. con and even reputation. Commitment: When your customer is ready to commit, making the purchase should be the easiest part. Your checkout or sign-up process should be user-friendly on both desktop and mobile devices and your contact information should be easy to find in case customers want to make in-store purchases or want to talk to a live person. Support: This phase is often overlooked since the customer has already purchased or converted. Supporting the customer as they use the product or service is vital to continued growth. How are you supporting and staying in contact your customers? Product use demonstrations for complex features, getting started guides and email newsletters tailored for use/engagement of your product or service is a great way to emphasize that your customers made the right decision and you are meeting their needs. Additional communication through social or email to keep them current on changes, new offerings, incentives, discounts, etc. can inspire brand loyalty. When customers are happy with your products and services they will advocate your brand through testimonials and reviews, which supports future customers in their decision journey and search cycle. Once you understand the journey your persona, or hypothetical customer, is taking to convert and remain loyal, you can audit your content to ensure you’re fulfilling his or her needs at each phase of the search cycle. You may find that you lack content or that your marketing message should be reframed. Perhaps you have a website, but it’s not optimized for the right keywords or you don’t address common customer questions. In the case of Social Sara, you could lose customers if you don’t have a page dedicated to fitness classes. You’ve done the work to empathize with your customers, and now it’s time to make sure you’re supporting them at all the stages of the consumer decision journey and search cycle. As with any marketing strategy, it’s important to monitor the impact of recent changes to determine if they’re having the intended effect. Start by checking that Google Analytics is installed and tracking correctly. If analytics data is accurate and reveals that certain pages are performing poorly, then you may need to make adjustments. For instance, you may have created a page about fitness classes but failed to optimize other pages that should link to the fitness classes page, or maybe the user experience is poor and needs the use of images or video. Maybe users are having a hard time navigating to the classes page on mobile devices. There are numerous online resources to help you analyze website visitor traffic and troubleshoot the problem. For years, the focus of many digital marketers was primarily on which keywords had a high search volume and low competition. Not enough attention was paid to the people behind those keywords—on trying to understand their intent for entering those strings of words in search engines in the first place. Now business owners and marketers have access to a wealth of user data, and audience targeting can help them make sense of that data to better understand their customers and, ultimately, to establish a value-added link between their business objective and their customers’ needs. Thanks for joining us in this 4-part series on Audience Targeting! Customers today are inundated with marketing messages, making it more important than ever to craft customized campaigns that speak to their specific needs. Audience targeting is an excellent way for marketers to utilize the abundance of user data available to gain actionable insights and create highly individualized campaigns. Building personas can add a level of specificity to audience targeting that allows for even greater personalization—and in this guide we’ll show you how. Personas are essentially fictional characters created from a combination of conjecture, research and data. A persona is a representation of a specific type of customer, complete with details about his or her wants, needs and fears. Constructing these imaginary customers can enable you to better understand the thought processes of your actual customers, including the questions and concerns they may have when considering to purchase your product. Equipped with this knowledge, you can then tailor your content to assuage their concerns and show how your service or product offers a solution to their problems. In our first post on audience targeting, we used a gym as a business model and gave an example of one persona that could represent a certain type of gym member: the woman who regularly attends classes because they not only fit into her busy schedule but also allow her to see friends while staying in shape. We named her Social Sara. Below, you’ll learn how we created her and how you can do the same to start customizing your content to the specific needs, behaviors and concerns of your target audience. Before you begin, you may find it useful to identify target areas where your business would like to improve its marketing. Continuing with our example, you might notice that some gym classes are crowded and others are empty. If you want to investigate why, you could build a persona for the typical class attendee. Doing so may also elucidate potential improvements you could make to fill the empty classes, like how they could be more appealing to more people. Whether or not you’ve already conducted research about your different market segments, you can build on what you know about a type of customer by brainstorming who they are, what they do, when they do it, and where. Most importantly, ask why. What motivates them? What do they need? What do they want? This will allow you to form a hypothesis about your persona that you can validate later with data. The majority of the members who frequent classes are women between the ages of 25 and 45. Attendance is highest in the early morning and late evening. Boot camp is more popular than crossfit. Classes involve more personal interaction than weight lifting, so maybe these members come to socialize as much as to stay in shape. Women in this age group tend either to work or have children, which could explain the times they prefer—before or after work or when they can find a babysitter. Lastly, crossfit can be quite strenuous, while boot camp mixes lighter weights with aerobics, the latter perhaps being more appealing to female members. Once you’ve formulated a hypothesis for your persona, you may wish to test it with evidence. Below are some online tools that can help you find data to back up your assumptions. Google Analytics: Which pages received the most user engagement? In Google Analytics, you’ll want to look at “time on page”, “bounce rate” and “exit rate” which represents the “stickiness” of a page and also whether the visitor is finding the content interesting. Are pages with class schedules for boot camp receiving more user engagement than those for crossfit? Social Analytics: Facebook Page Insights can provide information about who’s being reached by and engaging with specific content. You can use Twitter Search to find discussions about your gym or more general fitness trends. Surveys: Whether you send them out to existing customers or offer them to anyone who visits your website, surveys allow you to discover firsthand your audience’s wants and needs. For example, you could ask which class times are preferable and why. SurveyMonkey provides free online survey software and questionnaires. Demographic Data Aggregators: Websites like com offer a breakdown of the percentage of males and females in a given area, the median resident age, and the median household income. Internal Data: Customer databases and class scheduling systems can provide insight into who is attending which classes and when. When you’ve narrowed down the characteristics of your persona, you can use a template to help you organize the information into a more visual format. Xtensio has a free persona template builder. Work Details: She works a typical 9-to-5-office job, spending too much time, in her opinion, at her desk. Goals or Challenges: Staying in shape due to type of work and making time for friends now that she’s married. Values and Fears: Values family and friends. Fears falling victim to the health problems that plague most of her family: high blood pressure and cholesterol. Marketing Message: Gym with fun, effective classes and schedules. Elevator Pitch: Looking for a gym where you can stay fit with friends? We offer fun, effective classes and a flexible schedule. Social Sara, however, is just one segment of your market. You may also want to build personas for Jim, the bodybuilder, Tara the Triathlete, and so on. Most businesses generally create 2 to 4 personas. If one type of customer appears to be particularly representative of your entire customer base, then you may only choose to focus on that persona. Let SEO Savvy help you reach your goals. Talk with us today! Learn more about how our customized digital marketing solutions can boost your organic traffic. Copyright © 2019 SEO Savvy. All rights reserved.